Located just outside of the tiny hamlet known as Sierra City lies the Kentucky Mine and Museum. The county park operated by the Sierra County Historical Society and open to the public, features a museum, stamp mill, portal entrance to the now defunct gold mine, an extensive picnic area and numerous mining artifacts dating back to the days when gold mining was rampart throughout this region of the Sierra Nevada. The park also boasts an amphitheater, carved into the mountainside and surrounded by towering pines and oaks. The amphitheater seats two hundred patrons, has a performance stage and dance floor. Pre-concert BBQ dinners served by the “Red Moose Cafe” ($16) will be offered at the Saturday night concerts beginning at 6pm or bring your own picnic! Tickets can be purchased online below, at retail businesses throughout Sierra and Plumas County or at the door. Contact Chris Stockdale for retail ticket locations, questions or concerns: (530) 862-1076. Season tickets are available for $85 until June 23 – contact Chris. 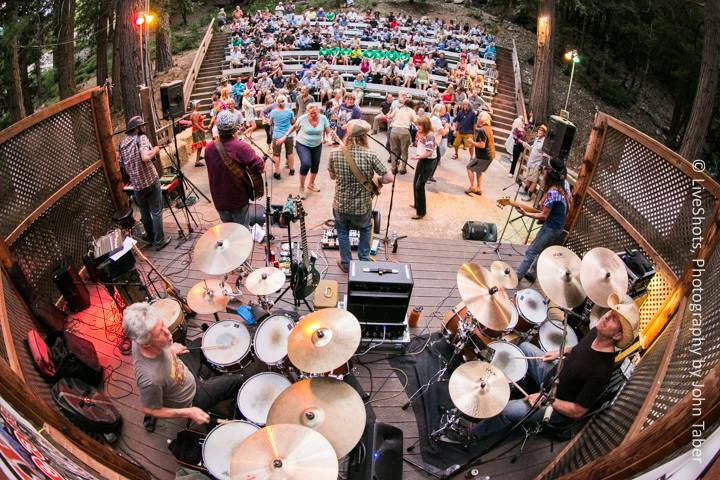 Mumbo Gumbo is sponsored by a generous grant from the Sierra County Arts Council. Our “Opening Day” celebration is largely a free event for the public. In addition to the featured concert, offerings and activities include a $5 BBQ, a free magic show, mine tours, ice cream sundae bar, face painting and balloon creations for the kids.